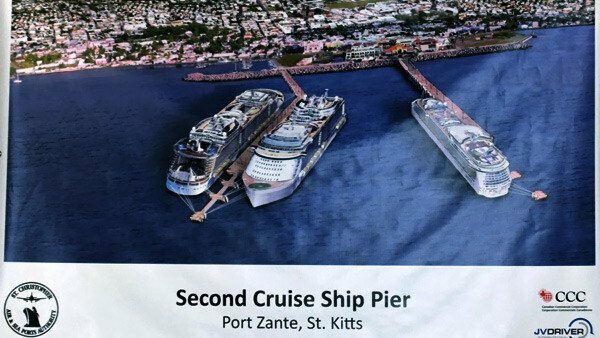 The construction of a second cruise pier at Port Zante will come at an opportune time as larger ships are being built, says Minister of Public Infrastructure, Honourable Ian Patches Liburd. The minister added that even though the competition for vessel deployments of major cruise operators is immense, the Caribbean has continued to maintain its position. The minister of public infrastructure said that the increasing trend to deploy vessels that can accommodate in excess of three thousand passengers has prompted the government and by extension the Caribbean to put infrastructure in place to accommodate larger vessels. The minister said that tourism in general has a cascading effect on the economy. Minister Liburd said that increased cruise ship passengers will create significant opportunities for employment and self-employment of Kittitians and Nevisians. He noted that there will also be an â€œincreased earning of foreign exchange and a very clear opportunity to showcase St. Kitts and Nevis for return land based visits.â€ He added that there will be an increased purchase of real-estate and promotion of the Citizenship by Investment Programme (CBI).